Now reduced in price, from $ 1.350.000 now $ 950.000 USD! 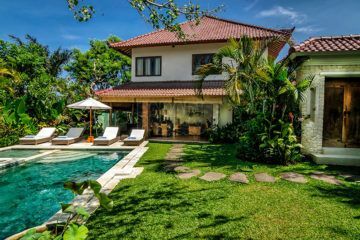 This 5 bedroom villa built on 1500 square meter of land is a must view property in Seminyak. The modern Balinese style architecture set in a green lush garden with 2 pools gives you this perfect tropical Bali living. The villa is located in a secure area with 24/7 security and it will take you a short walk to the beach. Famous venues like Ku De Ta, Alila Hotel and Potato Head are in the near area and it will take you a 45 minute drive to Ngurah Rai International Airport. Seminyak is known for its famous established restaurants with chefs from around the world, flag-ship stores and boutiques. Entering the property, you walk into the lush garden with 2 swimming pools with a sunbathing terrace. The open living room overlooking the garden and pool comes with a spacious kitchen and access to the staff quarters with laundry, storage, wet kitchen and maids room. Each of the bedrooms comes with an en suite bathroom and is fully decorated and furnished. One of the bedrooms is located on the second floor, whilst all the other bedrooms are on the first floor with access to the garden. This is a very good lifestyle investment where you can enjoy a five star property and the rental returns will cover operating expenses throughout the year while also providing spending money for your holidays here in Bali.